Neo-Nazis marching through the streets of Sweden, the far-right making its political presence felt in Austria, a beefed up military and police presence on borders in many parts of Europe and stinging criticism on moral and legal grounds of the “one in, one out” agreement with Turkey from human rights groups – these are just some of the signs of the existential crisis that the European Union is experiencing. The catalyst for this quandary over the EU’s raison d’etre has been the arrival of hundreds of thousands of refugees on Europe’s shores since last year. Europe’s response has often seemed slow, selfish and driven by fear. Backs have been turned, fingers have been pointed and border fences have gone up. This has not resembled the progressive, open and self-confident EU that many policymakers thought they had been constructing over the last decades. Looking for the heart of the EU within the negativity that has been generated by this massive movement of people from war-torn countries to an affluent, stable continent can be a thankless task. But, for those who still want to appreciate Europe’s potential, it can be a rewarding effort. An international forum held in Barcelona this week provided representatives of civil society and local government a chance to tell their uplifting stories of efforts, sometimes on a small scale, other times on a larger one, to receive and integrate refugees into their communities. 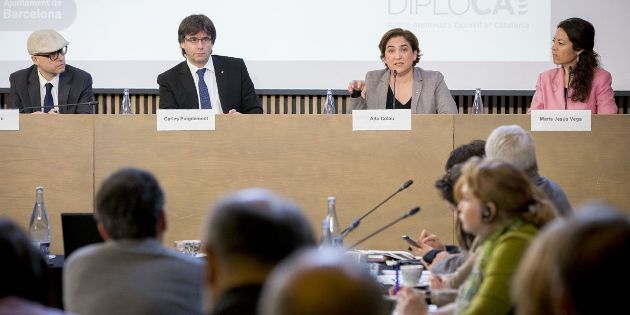 Organised by the Public Diplomacy Council of Catalonia (Diplocat), the one-day event saw a series of experts, officials and activists give their accounts of schemes and initiatives to care for new arrivals and, in the process, cast a much more favourable light on Europe. There is the IFA (Institut für Auslandsbeziehungen) in Germany using culture as a bridge between refugees and locals, the Punt de Referencia association in Catalonia, which pairs young refugees with locals of a similar age that are willing to act as their mentors for six months, the Danish Centre for Gender, Equality and Diversity, which runs similar programmes for female refugees, and the Solidarity 4 All group in Greece that worked with six municipalities in Athens to run awareness campaigns in schools, encouraging pupils to collect donations for refugees and allowing refugee children to visit the schools. The list can go on but these are some examples of the hard and methodical work that is being done behind the scenes to bolster Europe’s humanism and provide practical help to people who are in such desperate need of it. Another participant, Chilean psychiatrist Jorge Barudy, speaks of a “tribe of people who base their actions on generosity and solidarity”. Barudy, who came to Barcelona in the 1970s as an exile from his homeland, provides psychological support to refugees through the Asil.cat network. To highlight the often unseen mental impact of refugees’ traumatic experiences, he takes a sheet of A4 paper and scrunches it up in his fist. The crumpled ball represents the refugee’s state of mind. The task is to restore calm, he says, while caringly smoothing out the piece of paper. “We should stop talking about member states and start talking about society,” says IFA secretary general Ronald Gratz, highlighting the ability of civil society to be much more flexible and responsive than central governments, which face bureaucratic hurdles and are often hampered by political concerns. “Many small people in small places doing small things can change the world,” says Cadiz mayor José María Gonzalez, quoting the late Uruguayan writer Eduardo Galeano. Whether it is the rocky shores of Lesvos, the muddy fields of Idomeni, the arid expanse of Lampedusa or the daunting streets of northern or central European cities, “small people” have been helping to make a world of difference to the shattered lives of thousands of people. However, as Gonzalez knows, there is a layer of power between civil society and central governments that has yet to fulfil its potential in dealing with the refugee crisis. In fact, the other prevalent theme of the Barcelona forum was the frustration felt by local authorities that feel they are well positioned to assist in the reception and integration of refugees but are so far largely being shut out of the process due to decisions at the EU and national level. The President of Catalonia, Carles Puigdemont, says his region is prepared to take in 4,500 refuges and 1,800 of those immediately but is prevented from doing so by the Spanish government. “We want to contribute to a more united Europe,” he says, while blaming divisions in his own country from allowing Catalonia to do its bit. While Colau’s and Puidgemont’s comments also have to do with the tense relationship between Catalonia and Madrid, others representing local authorities in other countries also express concern about their willingness to help being shunned. Mateusz Klinowski, the mayor of the small city of Wadowice in southern Poland, recounts how he was the first local government official to offer to take in some of his country’s share of refugees under the EU relocation scheme. Being the birthplace of Pope John Paul II, Klinowski said he felt that it was apt for the legacy of Wadowice’s most famous son that the city should host refugees. Poland’s government, though, had other ideas and made it clear it had no intention to living up to its relocation quota. Klinowski said he was bombarded by a “wave of hatred” that included comments about sending refugees to nearby Auschwitz. Rather than helping refugees build a new life, Klinowski now finds himself being investigated by a prosecutor for comments he made in answer to his critics. Attica Governor Rena Dourou was another participant that lamented the restrictions on local governments being able to act on their own initiative and independently of national administrations. “We are stuck in the EU of member states,” she said. Dourou called for a more coherent and consistent asylum system, a clearer legal framework governing the actions of local authorities and for municipalities and regions to be given direct access to EU funds so they can run schemes to receive and integrate refugees. Bridging this gap between the willingness and ability to act may be where Europe can regain some of its moral standing. It certainly cannot feel that so many of its ordinary citizens doing extraordinary things to support newcomers is enough. In fact, these selfless Europeans have set the bar high and are challenging their politicians to make the leap. The good news for the EU is that in the search for its heart, a pulse has been located. The challenge now is to get the rest of the body working. This article was first published in a recent e-newsletter, which are available to subscribers. More information about subscriptions is available here.